Remove meat from cooked lobsters. Cut meat into cubes and fry in a generous amount of butter until very lightly browned. 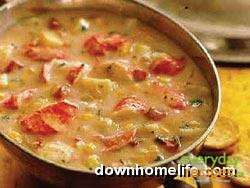 Heat milk, then add to lobster meat and cook slowly for 5-10 min. Add heavy cream and bring just to the boiling point. Add salt and pepper to taste and a little paprika for colour.